The Spoked Traveller | Giveaways! You know them as doing one thing really, really well: beer. 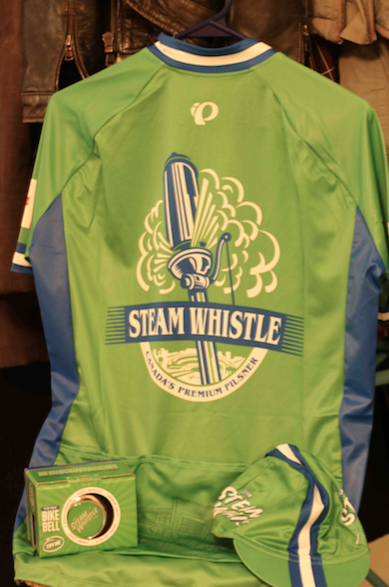 But, did you also know that Steam Whistle Brewery, as a company, is also a huge cycling advocate? In addition to hosting the Toronto bike awards, across Canada they have over 30 bike repair stations. Find a repair station near you, HERE. This past December, I sat down with an employee, Max Walton, who commutes into the Toronto office (Steam Whistle HQ at the John Street Roundhouse) for a chat about riding in the winter and Toronto’s commuting culture. Download and read the interview here, STEAM WHISTLE MC. If you are the first person to correctly answer these questions–and give me one hell-of-a riding in winter bike tip— before March 1, you will receive a Steam Whistle jersey, bike bell and cycling hat. Voila! 1.What does Max call the mud stain you get from riding without a fender? 2.What are Max’s favourite (two) segregated bike streets in Toronto? 3. What are three tips for safe and warm riding in winter? 4. Gear, safety, routes? What is your best winter commuting advice?